Rubber stamped autographs have a dull look to them. They don't shine too nicely on glossy paper and they just have a lifeless look to them. Lifeless is a good description for them because they didn’t originate from a live hand. They didn’t flow from the hand of one you admire and transfer a piece of celebrity from hand to pen to paper, and I think that is the whole magic of autograph collecting. Rubber stamps are a dip in ink with a plate and apply. One motion. And that is why these autographs really stand out in my eyes. I don’t see all the little variations found in hand writing. No dots, no hesitation marks, no variation in pressure, no lines crossing over in a flow. Just a dull image made from one motion. I have seen some newer more elaborate rubber stamps. It looks like they are done in sections so it will appear like the lines are crossing over eachother making a weird looking print of unnatural pen line flow. Your eyes can’t follow the lines because the word flow make no liner sense. It is in sections and layers. Sometimes rubber stamps can have a textured, bumpy "GLOPPY" look to them and the lines are just a little or a lot too thick. Notice the shakey lines around the the curved writings. This shakeyness is a result of tracing slowly as the hand naturally shakes. 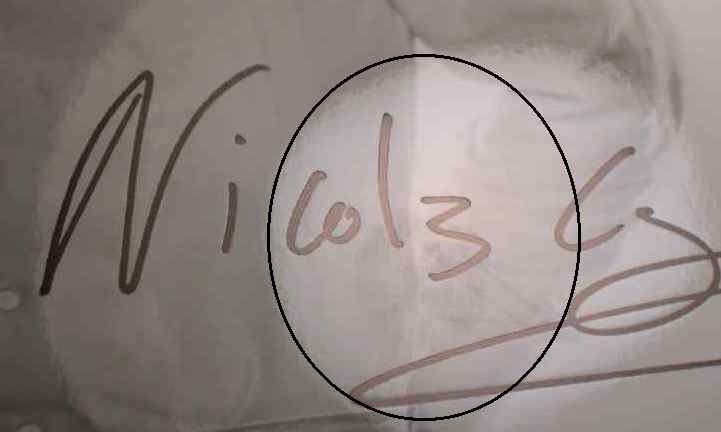 Beware of these types of fraud autographs on the internet and internet auctions! That's where I obtained this fradulent signature on sheet music from a seller in New Jersey. These produce a large bulk of forged autographs. This is a device that can be manipulated to hold a pen and copy a signature. The look of it will be unnatural. In some areas it tends to look (shaky). I believe this is because the machine moves the pen slowly. It writes with a mechanical flow, not a human one. The pen is held at an unnatural angle and this makes all the pen lines have the same thickness without variable pressure strokes. New laser autopens are looking more convincing however will still look funny, like the signature is floating on the paper.Another example of an Autopen. This signature looks too perfect. It also seems etched or laser printed on to the paper. Notice the unvaraint indentation marks. Celebrities have always had secretaries sign photos for them. Some secretarial signatures are so good even the experts have trouble telling the difference. Other examples are easier to tell. I have seen photos that contain both a secretarial inscription (“To what’s your face, Love,”) and a preprinted autograph of the celebrity. Inscriptions are personal messages or cartoons written along with the autograph. I love them because it’s more writing from a celebrity and more examples of handwriting to authenticate. I feel more confident buying an inscribed item because there is less of a chance the writing as all a rubber stamp. Most of the real autographs you will run across will have inscriptions. 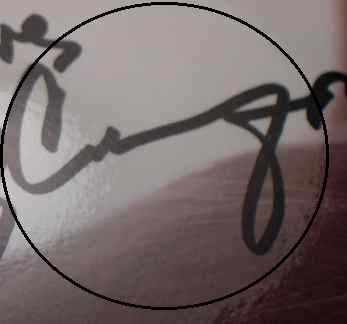 Some celebrities insist on addressing their autograph to someone to discourage the autograph from being sold. Some collectors don’t want an autograph inscribed to Harry if their name isn’t Harry. I have a large autograph collection myself. At least half have inscriptions to myself or someone else. If a seller never has inscribed autographs, I would be EXTREMELY suspicious. He followed my Advice and has No More Autograph Worries!! !